Located in the heartland of America, Oklahoma has over 200 artificial lakes, more than any other state. These reservoirs contain over one million surface acres of water and 2,000 more miles of shoreline than the Atlantic and Gulf coasts combined. Lake Eufaula, the largest in the state, contains 102,000 surface acres of water. Other major lakes include Fort Gibson Lake, Lake Hudson, Keystone Lake, Oologah Lake, and Lake Texoma. Reservoirs require rivers and more than 25 rivers crisscross Oklahoma. The Red River flows along much of the border with Texas and the Canadian River bisects the state. Tulsa is the nation’s most inland seaport connecting the state to the ocean via the Arkansas River and the Mississippi River. With all the lakes and rivers in Oklahoma, almost 2% of the state (1,231 square miles) is covered by water. Given all of Oklahoma’s artificial lakes, many archeological and historical sites that once were located along the banks of rivers are submerged now at the bottom of reservoirs. This includes Native American sites and historic settlements. It also includes shipwrecks like the J.R. Williams. In 1864, the steamboat J.R. Williams was carrying commissary goods and supplies up the Arkansas River from Fort Smith to Fort Gibson for the Union Army when it was fired upon by the Confederate First Indian Brigade under the command of Cherokee Colonel Stand Watie. Disabled and run aground, the vessel was abandoned by its crew. The Confederates began offloading stores but were unable to defend the captured vessel from advancing Union troops so they burned it and the remaining supplies. The Oklahoma Historical Society has placed a marker near the location of the battle east of Stigler, Oklahoma. What is left of the J.R. Williams is somewhere on the bottom of Robert S. Kerr Lake. In 1991, the remains of a mid-19th century steamboat were discovered by local landowners in the Red River following a major flood. 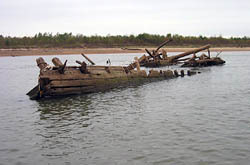 The Oklahoma Historical Society began a multi-year study of the shipwreck in 1999 with the assistance of the Institute of Nautical Archaeology at Texas A&M University. The initial site assessment was followed by archival research, additional fieldwork to document the site, and conservation of recovered artifacts. The vessel is thought to be the Heroine, which sank in 1838 when it hit a snag two miles downstream from its destination of Fort Towson. A model of the ship was made and placed on public display at the Oklahoma History Center to tell the story of the Heroine and navigation on the Red River. Who takes care of Oklahoma's underwater archeological sites? The Oklahoma Historical Society is responsible for preserving and perpetuating the history of the state and its people. The Society accomplishes its mission by collecting, interpreting and disseminating knowledge about Oklahoma and the Southwest. The Society works with the State Archeologist at the Oklahoma Archeological Survey, which is responsible for maintaining information about the state’s archeological sites and for issuing permits for exploration or excavation of sites in Oklahoma. You need a permit from the State Archeologist to take, salvage, excavate, restore, or conduct scientific or educational studies of archeological sites including shipwrecks. The State Archeologist evaluates the permit applicant’s research design, the qualifications of persons involved in the project, and specifications of the project before issuing any permit. A final professional report must be submitted and all recovered objects and materials, along with field notes and records, must be deposited in a museum or other state recognized repository. Are there any underwater parks in Oklahoma? Oklahoma has an underwater scuba diving park at Lake Tenkiller in Sequoyah County. In addition to intriguing underwater terrain, scuba divers can see the remains of buildings and structures from the town that was flooded by creation of the reservoir. What laws concern underwater archeology in Oklahoma? Relevant laws include the State Register of Historic Places Act and the State Antiquities Act in § 351, et seq., and § 361, et seq., respectively, of Title 53 of the Oklahoma Statutes. These laws declare the state’s historical, archeological, architectural, and cultural heritage are among its most important assets and should be identified, recorded, and preserved.